Christmas is coming to Crystal Creek. Chloe and Connor have much to do in preparation for the event. This story follows the delightful pair as they create Christmas cards, do the Christmas cooking, sing carols at the old chooks home, and then enjoy the day itself. The alliteration is fun and although at first glance the verses appear to be a tongue twisters, clever construction makes the text playful, catchy and easy to read aloud. 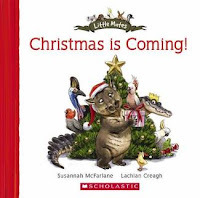 Both the language and the illustration create the happy atmosphere of a hot Aussie Christmas without the feeling of cliché. There is so much to look at in the pictures. I love details such as floaties on the little wombat swimming in the creek. Make sure you look closely at Connor’s carefully composed wish list. As it is part of the Little Mates series, children may have encountered many of the characters which populate this Christmas addition. They will enjoy hearing about their new adventures. It is a small book and would be perfect for popping in the post as a Christmas gift for pre-school aged friends and relatives overseas, as well as for those young children closer to home.